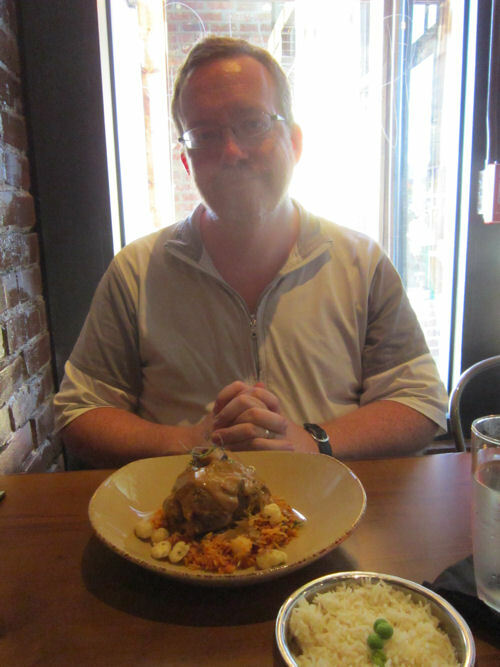 2015 Road Trip Photos #44: A Very Special “Chopped” Anniversary « Midlife Crisis Crossover! Our feature for the entree round: Kashmiri Spiced Braised Lamb Shank. Our eleventh wedding anniversary fell on Day Seven, but scheduling needs and fannish impatience dictated that we celebrate on Day Six. Longtime MCC readers know Anne and I are big fans of the Food Network’s fun, addictive cooking competition series Chopped. 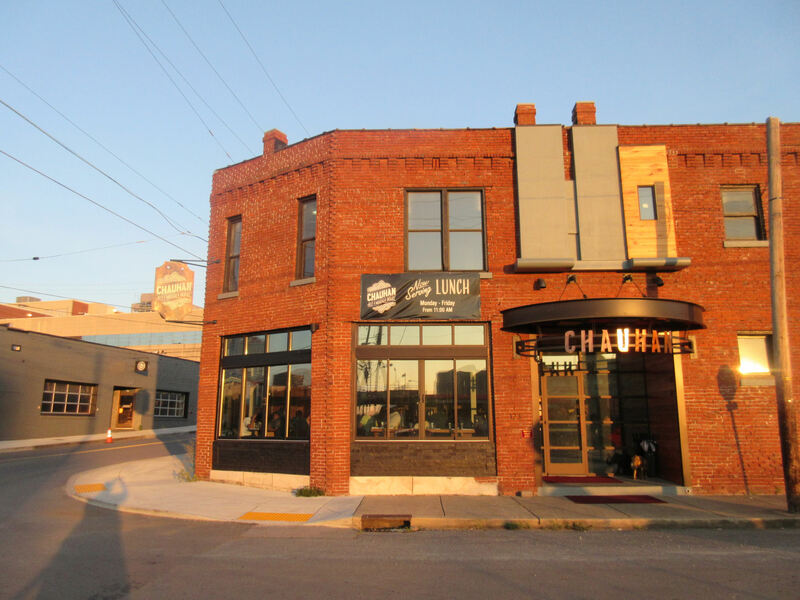 Most of its judges are restaurateurs and chefs who call NYC their home, but we were surprised during our vacation research to discover one judge owns a restaurant within 500 miles of our house and right along our path. We agreed it was a mandatory dinner stop. Getting there was the hardest part. Montgomery, AL, to Nashville, TN, should be a four-hour drive straight up I-65. 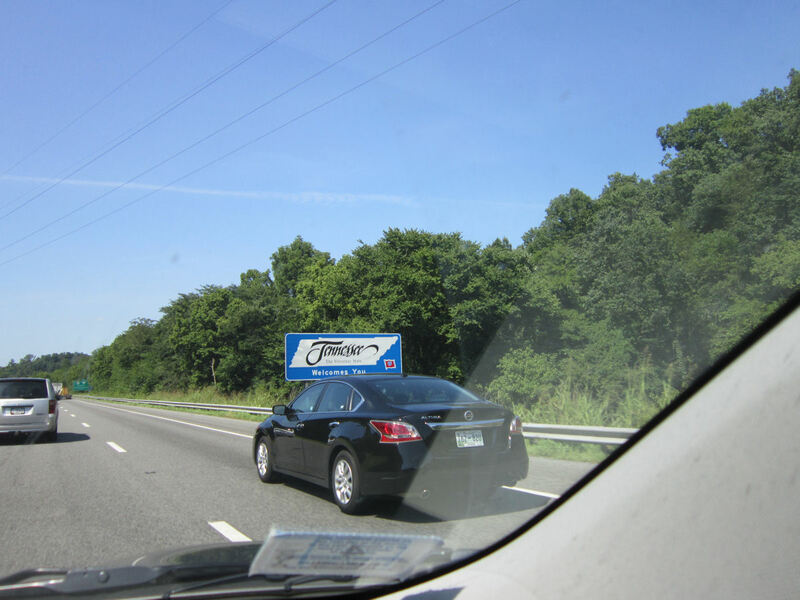 We were happy to see the “Welcome to Tennessee” sign, but chagrined when traffic beyond the border was stop/start on-again/off-again dawdling and moseying even before rush hour. Four hours became five-plus, and we arrived at our final hotel fatigued and maybe a little cranky as the weight of our long week continued to bear down upon us. You thought our 2015 southern road trip series was winding down? HA. Wait’ll you see the sights of Day Seven. Just. You. Wait. Despite all the drivers clearly plotting against us, we nonetheless made our reservations on time and, after doing three frustrated laps around extra-dense near-downtown non-linear Nashville with no public parking in sight, pulled into the valet lot at Chauhan Ale and Masala House, named after co-owner and executive chef Maneet Chauhan, As Seen on TV. We were beat, but we made it. Husband and wife, best friends, traveling companions, two-person Chopped fan club. The esteemed Ms. Chauhan was regrettably nowhere in sight, but we each enjoyed our company anyway. …and the husband she humors. 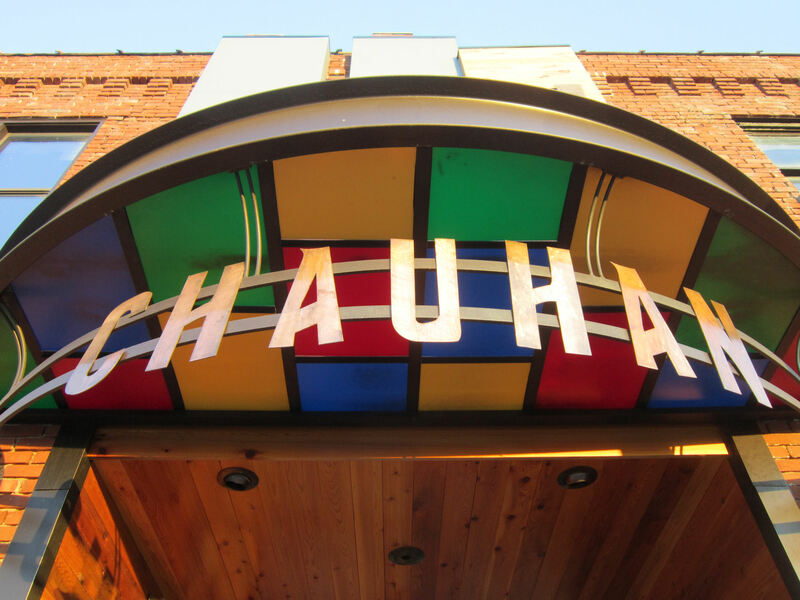 Trendy decor and servers mesh well with Chauhan’s style of “Asian-fusion” cuisine, as Ted Allen used to describe her until they stopped introducing the judges in every episode. 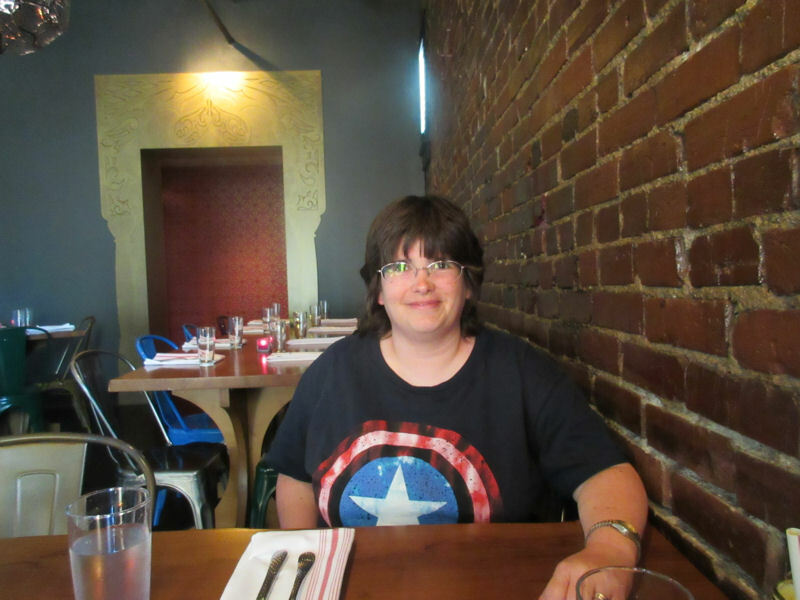 Anne’s threshold for spicy food usually extends about as far as Taco Bell mild sauce (setting aside that one marvelous Cajun shrimp meal in New Orleans), but she was willing to roll with it. 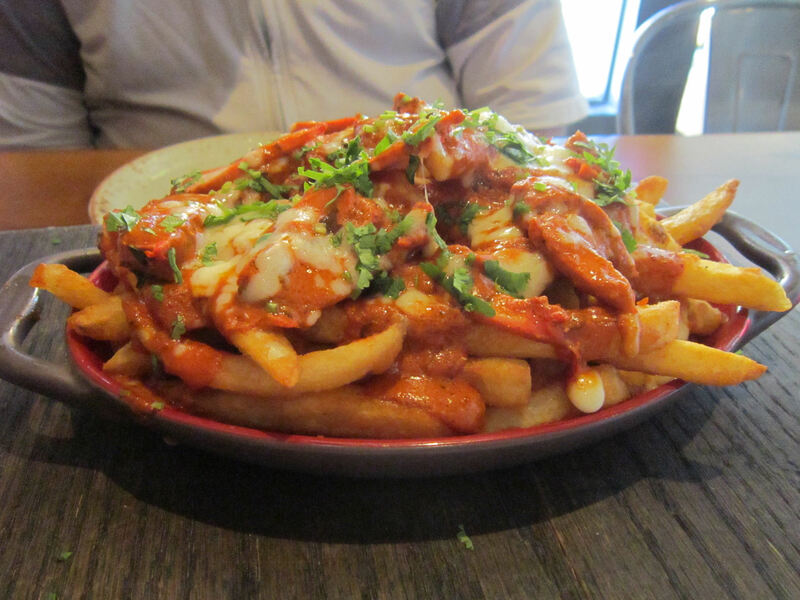 For our appetizer, we went with the Tandoori Chicken Poutine with mozzarella and makhani sauce. As you’d expect, I ate more of these than she did. Worth it. 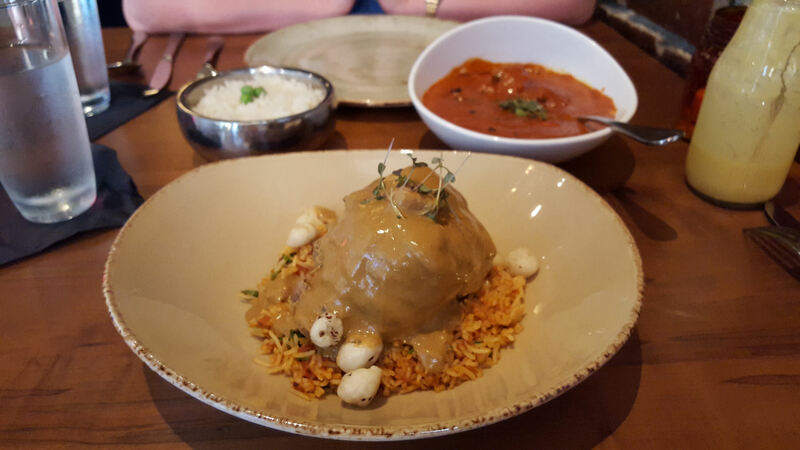 On our server’s recommendation, Anne went with the traditional chicken tikki masala, which somehow eluded our cameras altogether. The lead photo was my dinner of Kashmiri Spiced Braised Lamb Shank — lamb osso bucco with caramelized onions and almond sauce, served with tomato rice and tapioca papadum. The meat was tender and fell off the bone more quickly than I could stab it. The spice level was up there, but tantalizingly so. I approved. Sadly, between this and the poutine, neither of us left room for dessert. And to be candid, by this point our food budget was running on virtual fumes. All our non-hotel food on Day 7 would pretty much be over the line as it was. They offered a free toast in honor of our anniversary, but neither of us can stand alcohol. We did appreciate the gesture. And then we went back to our hotel and crashed. Days that contain more driving than sightseeing tend to take us down the most notches. Friday would be a different story. We had one last big day ahead of us, and a bit more to see in Nashville before returning to normal life. That name again. Once more, with spice. Chicken Tikki Masala: chicken chunks in a mildly spicy sauce, often yogurt-based. A few Indianapolis food trucks make great versions of this. Tandoori Chicken: Ditto, but different spices, and closer to red than tikki masala orange. Makhani: Sauce of butter, tomato, and spices. They really like spices. Mango Lassi: Forgot to mention I had a tasty drink, yogurt-based because they also really like yogurt. Anne ordered her standard ice water. Kashmiri Spiced: Uses a base of the popular Indian spice combo called garam masala, which may or may not contain peppercorns, cloves, cinnamon, nutmeg, mace, cardamom, bay leaves, and/or cumin. Pingback: 99 Ways to Get Chopped from “Chopped”: A Handy Tips-‘n’-Tricks Checklist « Midlife Crisis Crossover!